Planning a family outing? Make sure you get your tickets to the Georgia National Fair. Gates open on Thursday, and set up is well underway for your favorite rides and food stands. In just three days, the Georgia National Fairgrounds will be full of fairgoers young and old..
Like you, the LaFrattas wouldn't miss this fair - they've been selling cotton candy at the Georgia National Fair year after year. LaFratta said there are many variables that go into how long it takes to get set up. The plan to bring improvements to a busy corridor in Perry is no longer moving forward. City manager Lee Gilmour says Director of Economic Development Robert Smith sent a memo to mayor and council recommending the Community Improvement District planned for Courtney Hodges Boulevard be abandoned. The city's economic development leaders held two public meetings on the issue, but property owners had too many objections. Gilmour says the CID is supposed to be a property owner led initiative. It's not necessary for city council to take any action. Gilmour says the idea is simply dead for now. First-responders from eight different states, including New York and Indiana, are in Perry this week. They're using the Guardian Centers for disaster relief training. "This is far better than other places we've been," said Lenny Nesbitt of Task Force 6 from North Georgia. He says the disaster relief training he's received at the center has prepared him for travesties like the parking deck collapse in Atlanta. The facility provides real life scenarios for first-responders, and even goes to the lengths of having actors portray victims. Amenities like these are why fire fighters from as far as New York City travel down. "This facility has an outstanding reputation," said Ronald Spadafora, Fire Prevention Chief at FDNY. Some property owners in Perry sat down to discuss improvements to General Courtney Hodges Boulevard on Monday evening. "I'm probably leaning more for it than many are, but I haven't had all of my questions answered either," said William Davis of Crossroads Medical Management. He would like to see the roads enhanced and the area beautified. There are 12 projects on the proposed list ranging from enhancing landscaping to enhanced patrol. People flock to the Georgia National Fair at the Georgia National Fairgrounds and Agricenter in Perry for food and rides, but to cast a vote? That's the idea this October 8th through the 18th. Secretary of State Brian Kemp plans to organize the first-ever "Peanut Poll". A German textile supplier will build a manufacturing plant in Houston County, which will bring about $30 million and 140 new jobs to the county's economy. 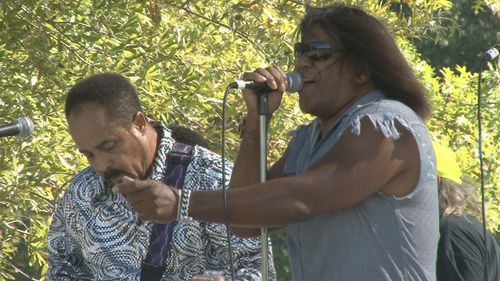 There was plenty of music, good food and lots of dancing at the 6th Annual Perry Music Festival Saturday. The theme of this year's festival was "We Know Music" and they certainly delivered on that promise, with 10 artists ranging from jazz and rock and roll, to gospel and R&B. Jane Thomas helped organize this year's festival. She said the event helps bring the community together.